The Roman Empire in 117 AD, at its greatest extent during تراجان's reign. ↑ Bennett, J. Trajan: Optimus Princeps. 1997. Fig. 1. Regions east of the دریائے فرات river were held only in the years 116–117. ^ ا ب پ Taagepera، Rein (1979). "Size and Duration of Empires: Growth-Decline Curves, 600 B.C. to 600 A.D". Social Science History (Duke University Press) 3 (3/4): 118. doi:10.2307/1170959. http://www.jstor.org/stable/1170959?seq=4. ↑ Turchin، Peter; Adams، Jonathan M.; Hall، Thomas D (December 2006). "East-West Orientation of Historical Empires". Journal of world-systems research 12 (2): 219–229. آئی ایس ایس این 1076-156X. http://peterturchin.com/PDF/Turchin_Adams_Hall_2006.pdf۔ اخذ کردہ بتاریخ 6 February 2016. ↑ Other ways of referring to the "Roman Empire" among the Romans and Greeks themselves included Res publica Romana or Imperium Romanorum (also in Greek: Βασιλεία τῶν Ῥωμαίων – Basileíā tôn Rhōmaíōn – ["Dominion (Literally 'kingdom') of the Romans"]) and Romania. Res publica means Roman "commonwealth" and can refer to both the Republican and the Imperial eras. 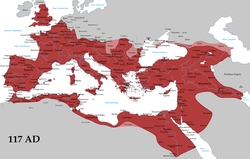 Imperium Romanum (or Romanorum) refers to the territorial extent of Roman authority. Populus Romanus ("the Roman people") was/is often used to indicate the Roman state in matters involving other nations. The term Romania, initially a colloquial term for the empire's territory as well as a collective name for its inhabitants, appears in Greek and Latin sources from the 4th century onward and was eventually carried over to the بازنطینی سلطنت (see R. L. Wolff, "Romania: The Latin Empire of Constantinople" in Speculum 23 (1948), pp. 1–34 and especially pp. 2–3).